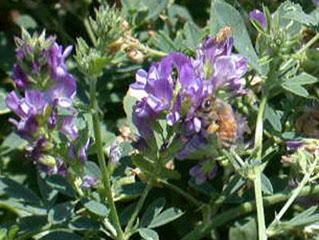 The purpose of this web site is to provide research based information about producing alfalfa for seed in California and to provide a mechanism to retrieve individual papers presented at the California Alfalfa Seed Production Symposium. In 1975, the first Alfalfa Seed Symposium was held in Fresno, CA and effectively communicated results of various research projects to the industry. That highly successful event continues today with the biennial presentation of research updates and/or other activities being conducted on behalf of the Alfalfa Seed Research Board, which is funded and directed by alfalfa seed growers and industry representatives in California. In addition, symposium participants have an opportunity to speak with the researchers conducting work related to alfalfa seed production and provide direction on future Board activities by completing a “Research Survey”. The members of the Alfalfa Seed Board recognize and thank University of California scientists as well as other researchers for their continued dedication to the seed industry. Over many years they have helped to define and solve numerous problems growers have faced in producing this challenging crop. The legacy of past work and the promise of future research build a foundation for all those in alfalfa seed production.